The Barbour Tartan Dog Coat is perfect for keeping your pooch warm during chilly spells. Featuring Barbour's signature quilted design and cord collar, your dog will look the part as well as being kept toasty and warm! 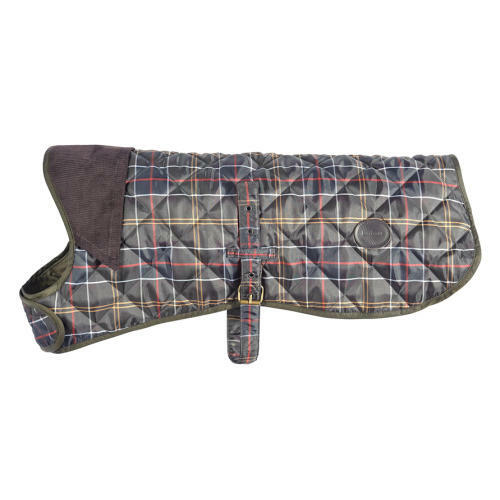 The Barbour Quilted Dog Coat buckles around the middle and connects around the neck with a velcro patch for added security, comfort and ease of movement. Measuring your dog for their coat: When measuring your dog for their new dog coat, it is important that you measure from the length from base of the neck to the start of the tail. This is where the head joins the body and where the tail joins the body. Make sure your dog is standing squarely upright on all four legs and is looking straight ahead for an accurate measurement. Secondly, measure the circumference around the widest part of the ribcage. Once you have done this you then need to refer to the size guide. If your dog's size does not match the size we have, then you should round up for dogs with downward tails and round down for dogs with upward tails. Please Note** Should you need to return this item, please ensure that it is in the condition it arrived complete with tags and original packaging to be eligible for a full and immediate refund/exchange.